Allergic rhinitis is a symptomatic disorder of the nose induced by an IgE-mediated inflammation of the nasal membranes in response to allergen exposure. Symptoms of rhinitis include rhinorrhea, nasal obstruction, nasal itching and sneezing which will be cured spontaneously or with treatment. The severity of allergic rhinitis can be classified as "mild" or "moderate-severe" (Fig. 5.1) based on symptoms and quality of life parameters. • It is often difficult to differentiate between seasonal and perennial symptoms. • The exposure to some pollen allergens is long-standing. 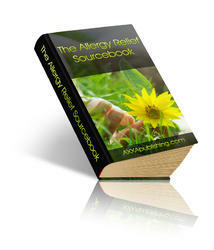 • The exposure to some perennial allergens is not similar over the year. • The majority of patients are now sensitised to pollen and perennial allergens. Thus, a major change in the subdivision of allergic rhinitis has been proposed by ARIA with the terms "intermittent" and "persistent" (Fig. 5.1). However, in the present document, the terms "seasonal" and "perennial" are still used for the description of published studies. Eye symptoms are common in patients suffering from allergic rhinitis, however, they do not exist in all patients. In some cases, eye symptoms may predominate over rhinitis, hence the presence of conjunctivitis should always be considered. On the other hand, conjunctivitis is not always induced by allergy triggers. The high prevalence of allergic rhinitis and its effect on quality of life have led to its being classified as a major chronic respiratory disease. It is reported to affect 10-40% of the global population and its prevalence is increasing both in children and adults. There are approximately 350 million people suffering from allergic rhinitis. The prevalence in European Union varies from 17% to 28% in different countries (Bauchau & Durham, 2001). Allergic rhinitis can significantly reduce quality of life, impairing sleep and adversely affecting leisure, social life, school performance, and work productivity (McMenamin 1994). The direct and indirect financial costs of allergic rhinitis including sick leave, school and work absenteeism and loss of productivity are substantial as well. Asthma is a chronic inflammatory disorder of the airways usually associated with variable airflow obstruction, which is often reversible, spontaneously or under treatment, and airway hyper-responsiveness (Global strategy 2002). Allergen sensi-tisation is an important risk factor for asthma and is also often associated with rhinitis (an inflammation of nose) (Bousquet et al. 2001). Typical symptoms of asthma are wheezing, shortness of breath, chest tightness and cough. Acute exacerbations may lead to even life-threatening asthma attacks. Asthma impairs school and work performance and social life. Physical quality of life is impaired by bronchial symptoms, whereas social life is also impaired by rhinitis co-morbidity. Asthma affects both children and adults. Using a conservative definition, it is estimated that as many as 300 million people of all ages and all ethnic backgrounds suffer from asthma, which is also the most common chronic disease in childhood. Two large multinational studies have assessed the prevalence of asthma around the world: the European Community Respiratory Health Survey (ECRHS) in adults (EC Survey 1996) and the International Study of Asthma and Allergies in Childhood (ISAAC 1998) (Fig. 5.2). Trends in asthma prevalence vary between countries. 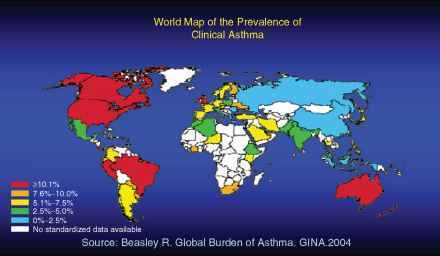 For the past 40 years, the prevalence of asthma has increased in all countries in parallel with that of allergy. Asthma still increases worldwide as communities adopt modern lifestyles and become urbanized. With a projected increase of proportion of the world population living in urban areas, there is likely to be a marked increase in the number of people with asthma worldwide over the next two decades. It is estimated that there may be an additional 100 million people with asthma by 2025. However, the prevalence of childhood asthma and allergy may decrease in some countries with a high prevalence of the disease and the increase of the asthma epidemic possibly coming to an end. For all of them, timely information on forthcoming pollen episodes and their severity would allow for tuned measures with higher efficiency, lower costs and reduced adverse effects. The patient-physician relationship and communication should be based on the needs of the patient. A patient-centered and structured consultation has shown to be effective, as well as individualized and guided self-management plans. Patients are able to modify their asthma treatment according to their symptoms and severity of the disease. The main goal of allergy treatment and management is to interfere with the underlying allergic inflammation. With early introduction of effective medications after a proper diagnosis of the allergic disorder inflammation can be controlled. Patients tend to regard themselves as "allergic to pollen" in general; for physicians, however, understanding the individual trigger mechanism can be an important guide to the effective treatment and control of the disease.